Bonjour from sunny St. Barth! We are delighted to resume publishing our monthly newsletter and happier still to share the good news of the island’s recovery. Hurricane Irma gave us all quite a scare. Communication was down, and we worried about the whole region, and especially our staff, friends, and island partners. As we previously – and happily – reported, all were unscathed; our rental and Sotheby’s sales offices were moderately damaged, now on the mend, and we are open for business. St. Barth Properties’ VP Tom Smyth came down here first and reported on the island’s recovery—with lots of pictures. I published my first post-Irma blog on September 13 and am continuing first-hand reports (See Peg’s Blog and scroll-up to see the exciting progress in sequence.) Keep updated by subscribing. I am now happily settled into Villa Everest for the season. 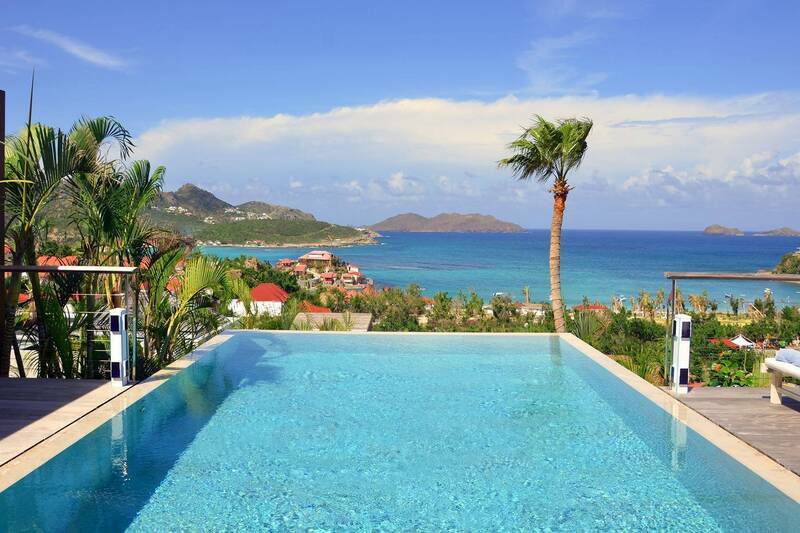 Thanks to all for the strong support and booking a stay on St. Barth. You may find it a bit different—the 5-star beach hotels are temporarily closed—but the 5 star hospitality, panache, and joie de vivre still abound. Our long-time clients note the more laidback vibe and say they it reminds them nostalgically of “old” St. Barth. They love it. I hope to see you on the island! Warm wishes to you and yours for the holidays. We are happy to report that many of the villas in our inventory required only minor repairs. Villa owners and managers are regularly advising us as they work toward their goal of being ready for the Season. Yay! We are pleased to welcome brand-new Villa Nikki to our portfolio, our first post-Irma addition. Villa Nikki – Poised hillside in popular St. Jean, this 3 bedroom villa offers casually elegant comfort, making it ideal for a St. Barth villa vacation. An infinity edge pool is the focal point of an expansive deck and is an optimum spot to relax – toes up – and take in the stunning views, the delightful breezes and the sound of rustling palms. A pergola is comfortably furnished for outdoor living and dining. Compact and sleek, the kitchen is outfitted to please a gourmet cook. It opens to a dining area that flows into the living space – ideal for TV viewing (Apple TV). The 3 spacious air-conditioned bedrooms all have en suite baths. Two (with king beds) are at opposite ends of the villa; at pool level, they boast ocean views. The third is lower level (its king bed is convertible to twins) and has a garden view. All are nice retreats. Devotees of perennial favorite Villa Royal Palm will be happy to hear that it was already accepting its first post-Irma guests on October 23, 2017. Hillside in Vitet, this deluxe 2 bedroom villa boasts stunning views of the sea, neighboring St. Maarten and glorious sunsets. Beautifully furnished, fully screened and air-conditioned throughout, it has an open floor plan that includes a well-equipped kitchen and living and dining areas. The indoor living space opens to a covered terrace – just perfect for dining alfresco and relaxing in the shade. Guests enjoy lounging poolside, and the surround sound music system adds to the ambience. The two (king) bedrooms have lovely en suite baths, making the villa perfect for couples to share. One of the baths can be accessed from the living room, so it conveniently functions as a powder room. Royal Palm offers the villa lifestyle at its best! 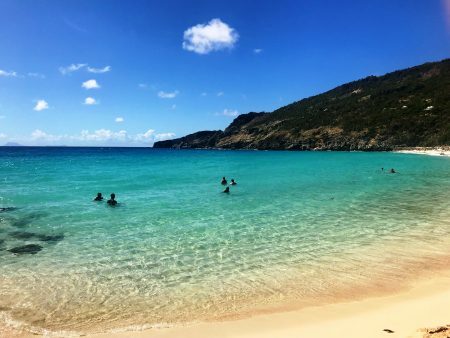 If you are thinking about coming to sunny St. Barth for the holidays, we have one more reason to tempt you. Superstar Jimmy Buffett is treating everyone to a free concert on December 27. Jimmy has been a frequent visitor to the island for decades, and it’s near and dear to his heart. Soley and other local musicians, will join in on the quai in Gustavia in celebration of St. Barth’s recovery. Congratulations to St. Barth Properties President Peg Walsh for being named again to Condé Nast Traveler’s list of Top Travel Specialists for 2017. 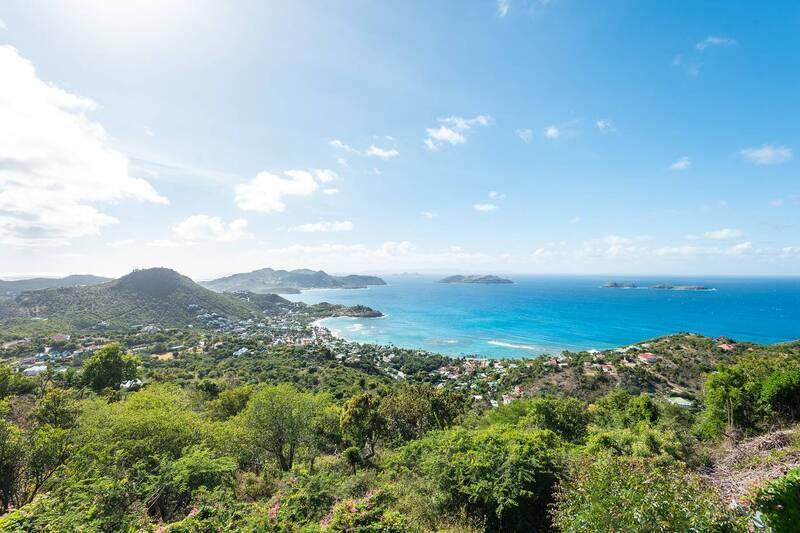 Our St. Barth Properties Villa and Hotel Specialists, Anne Cécile Bedford, Allegra Pawlowski and Julie Nally, conducted their semi-annual villa and hotel inspections, in that order, starting November 24, 2017. We are sure they will have lots of new information to report to you. One of the most frequent questions we receive is “Are the restaurants open?” The answer is yes! Currently, the majority are serving guests, including favorites L’Isola, Black Ginger, Le Tamarin, L’Esprit, Eddy’s, La Bagatelle. Many more will be open by the start of Festive Season, while others plan on January debuts. One of last season’s most popular new spots was the François Plantation at the 5 star Hotel Villa Marie. Although the hotel will not open until March 9, they began serving gourmet dinners and casual lunches poolside on December 15, 2017. Make your reservations with us; luncheon guests are welcome to use the pool and chaise lounges. What a nice afternoon! 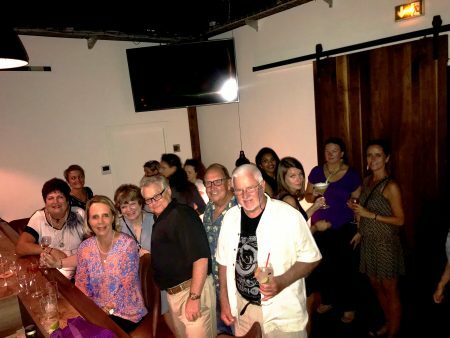 Our team had a celebratory evening at 25 Quarter Gustavia's hip street food restaurant. We started in their new Rhum Room bar and had Soley our favorite island crooner to serenade us. Fun. 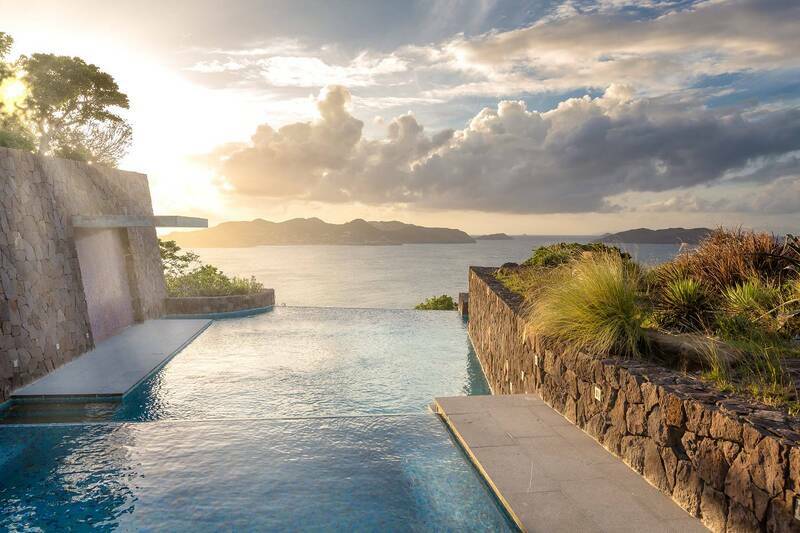 Le Barthélemy Hotel & Spa, Cheval Blanc St-Barth Isle de France, Le Guanahani and Le Sereno have not yet announced their reopening dates, but they likely will be in the fall of 2018. Well situated on Pointe Milou, this striking 3 bedroom villa offers privacy, tropical gardens and a stunning view of the sea. Fiery sunsets are a bonus. Contemporary styled, the indoor space is open and airy and includes living and dining areas. A chef-caliber kitchen has a separate entrance, and a guest bath is conveniently located. The indoor and outdoor spaces blend beautifully and look out to a sweeping terrace with a two-tier infinity pool. An adjacent teak deck faces the water and features a private alcove and a charming gazebo. The two master bedrooms have sumptuous en suite baths that open via glass sliders to private Jacuzzis. The third bedroom is also en suite. All are air-conditioned. Screens and fans enable a delightful, natural night’s sleep. We had easy flights from the US and were glad we booked the EasyWay transfer assist in St. Martin. It made the transfer seamless. The villa is lovely. We wanted to check on our old favorites first, so we had dinner the last 2 evenings at our usual haunts ... Le Piment and Eddy’s. Eddy welcomed us as did the owner of LP. Everyone (especially Odile) is welcoming of our support for the island. We are pleased to see all the recovery efforts being made. We are looking forward to trying Bagatelle and Le Ti Later this week. Aurélie was very helpful yesterday, as always. We were touched by her personal stories of her hurricane experience.